For McKnight, who shares his thoughtfully crafted Americana/folk pieces with audiences around the country, the chance to spend time with fellow Loudouners in an intimate venue is something he looks forward to every year. McKnight’s genealogical research over the last year has led to the discovery that music is truly in his blood. But ironically, the poet and musical storyteller started out as a STEM guy. McKnight grew up in a musical family in eastern Connecticut but was encouraged to think of music as a hobby rather than a career. McKnight took up the guitar in middle school and played in bands while studying chemistry in college and earning a graduate degree in environmental engineering. His engineering career brought him from New England to Northern Virginia when he landed a job in Fairfax County and found a rental off Snickersville Turnpike near Purcellville. “[Western Loudoun] became home really quick and it’s been home ever since,” he said. As a young engineer, McKnight continued to balance music with his day job. But layoffs at his company in the mid-90s became a turning point. McKnight kept his job, but saw it as a wakeup call. “There was this in-your-face, right-off-the-block realization that nobody else was going to look out for me so I might as well do something that I’m content doing,” he said. Meanwhile, opportunities in music were starting to grow, with his first performance at the Kennedy Center and an opportunity to play at the Olympic Village during the 1996 summer games in Atlanta. That year, McKnight made the decision to pursue music full time. He paid off his student loans, saved up for his first studio recording and took the plunge into full-time music. For the past 10 years, McKnight has lived near the western Loudoun village of Lincoln with his wife, Michelle, and 11-year-old daughter Madeleine. Madeleine plays the fiddle and occasionally collaborates with her dad, and it turns out she’s the latest generation in a long line of musical McKnights. Using family history passed on from his paternal grandmother along with the new information gleaned from a home DNA test, McKnight has been exploring his roots in New England and Europe. “It has been an amazing journey,” McKnight said. His research led to a trip to Northern Ireland last summer where McKnight, along with his parents and sister, connected with cousins in County Down. Those cousins gave McKnight a guitar made by noted Northern Ireland-based luthier George Lowden that had been in the family for 20 years. McKnight has also connected with newfound U.S.-based relatives including a number of musicians scattered across the country. The genealogical journey has also brought out a trove of details about his great-grandfather and namesake, Andrew McKnight, a fiddler and songwriter in the early 1900s who published a song called “Margaret,” dedicated to his wife, in 1906. Finding the sheet music for that song and hearing his sister play the song on the piano for the first time was a powerful connection to the past for McKnight. “My great-grandfather did this thing that I do—it was overwhelming,” he said. The experience has translated musically into “Treasures in My Chest,” a new song cycle exploring McKnight’s ancestry and the connection through music to his forebears. McKnight recently applied for grant funding to record the series, which would result in his first studio recording in more than a decade. McKnight has also put down roots locally and has celebrated stories from Loudoun in his work. His connection with Loudoun-based luthier Marty Fair of Fairbuilt Guitar Company inspired McKnight’s “By a Craftsman’s Hand” written in collaboration with another noted Loudoun-based songwriter, Les Thompson, is based on Fair’s work to create an instrument for McKnight using local wood. Playing for Loudoun audiences is another cherished tradition for McKnight. 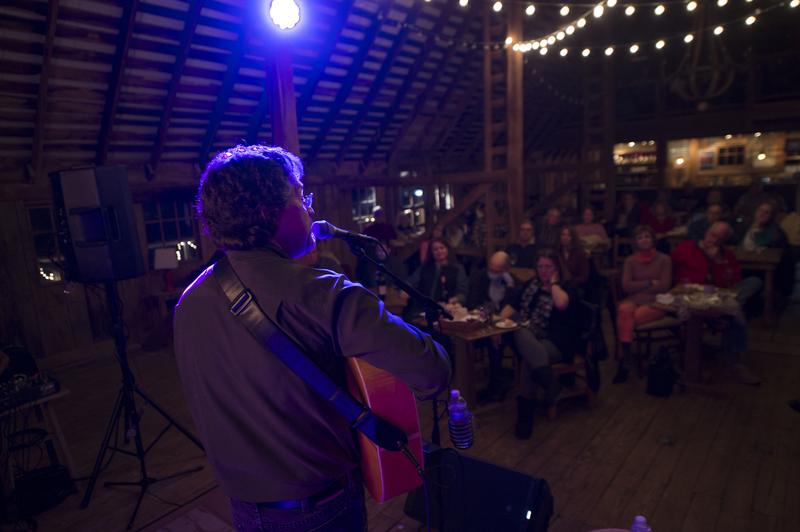 The listening room setting of the concert series at the Barns of Hamilton Station is something he looks forward to each year, and embraces the philosophical diversity of his Loudoun listeners. Andrew McKnight performs Saturday, Feb. 9 at the Barns of Hamilton Station, 16804 Hamilton Station Road, Hamilton.Doors open at 7 p.m. for mingling and conversation; performance starts at 8 p.m. Tickets are $15 in advance, $20 at the door and are available at eventbrite.com. For more information about Andrew McKnight, go to andrewmcknight.net.